You probably wouldn't notice it if you drove right past it -- but this week PG&E unveiled California’s largest battery, now storing electrons in San Jose. The project is a pilot for energy storage technology, as electric utilities look for ways to balance increasing amounts of solar and wind energy on the grid. The 4-megawatt sodium-sulfur array can power about 2,400 homes for up to seven hours. That takes a mighty big battery. “If you pulled a semi-truck up next to it, it would be about the same length and a little bit taller,” says Jon Eric Thalman of PG&E. That’s where PG&E’s battery project comes in. 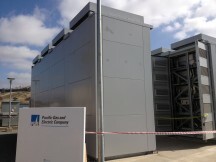 While this project is small, PG&E says it’s a pilot for energy storage projects down the road. “It is one of the main ways to think about storing energy because it’s so flexible, but there are challenges as have to solve,” says Venkat Srinivasan, of the Joint Center for Energy Storage Research at Lawrence Berkeley National Lab. “They are more expensive than we want them to be, but I think it’s a start,” he says. “It’s showing the proof of principal. 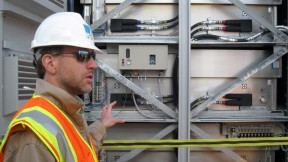 I think we need more of these before we figure out if these are viable technologies that we can use on a big scale.” PG&E's $18 million project was funded in part by a $3 million grant from the California Energy Commission. Fluctuations in renewable energy are currently balanced by natural gas power plants. PG&E also has a “pumped hydro” project where water is pumped uphill when there’s excess electricity and then generates power through a dam when demand peaks. The California Public Utilities Commission is looking at setting energy storage goals for the state’s utilities, based on a law passed in 2010. Southern California Edison is required to add at least 50 MW of energy storage to the grid as part of a larger plan for new power plants.